If you neglect to tell your gift buyers what you really want, sometimes you have to go buy it for yourself. Not to say that the gifts I got were in any way unwanted (because they were awesome), but I just wanted more! So what did I want more OF? Colored pencils! I had started out with a set of 72 Prismacolor pencils and have used them a lot. But sometimes I just wanted a slightly brighter red or a green with less yellow in it. When I saw a link to an exceptional deal on the 132 set of pencils, it went right into my cart. Now, I've been juggling just three flimsy plastic trays of pencils and knew that juggling 6 would be no fun. So I also ordered myself a case with 4 zippered sections and elastic that secures the individual pencils. The pencils come in some sort of order but I have yet to determine what that is. They are not entirely in order by color groups nor are they by color number (printed on the pencils) nor color name. Best I can determine they are arranged in the order they were released as colors were added to the range. So the first thing I did was divide them up into color groups. These were subdivided into ranges of light to dark within a specific family (denim blues vs. navy blue). I determined the order by scribbling on scratch paper. Then, with the pencils laid out in the order I wanted, I colored a 'key' on large-square graph paper and noted the color number under each. Neutrals are at the top, divided by warm, cool and 'french' grays. I stored the pencils in the binder pages following the chart. An empty space in the binder corresponds to where a nre range starts on the chart. All of the pencils are turned with the color numbers facing up so it is easy to pull the one I want from the notation on the key chart. I am glad I did the color key chart first asit is often difficult to recognize the true color of a pencil from the paint OR the tiny view of the lead. Some of the aquas were moved out of their chart sequence to fit in the binder in front of the greens. I knew that I would not be able to remember exactly what section of the binder a particular color could be found so I tied snippets of colored ribbons on the four zipper pulls representing the contents. While I was at it, I ordered a battery operated pencil sharpener. This is a cross-cut so it is less likely to break the leads than the little hand-held, single razor blade style. I have colored many projects already and love this new setup - not only the organization but having almost double the range of colors as before. I retired the old set of 72 to the studio where they will be used for greeting cards and less detailed projects. I was able to use a gift card I'd had for 4 1/2 years (!) 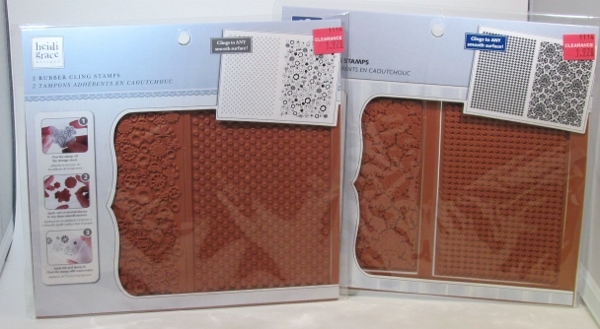 at a craft store yesterday and was delighted to find they had the last set of mini-distress pads in stock. I picked those up, along with a large set of Prismacolor colored pencils, a bit of fabric and some other random bits of fun supplies. Today, I set out to use the Distress inks. I started with a cardstock with big white dots on black background. I used Q-tips to apply the four colors in the set randomly on the dots. The colors are Lucky Clover (teal green), Wilted Violet, Candied Apple and Carved Pumpkin. There were a few dots left so I filled those with a Distress Marker in Old Paper. I used black ink to stamp unreadable script over the whole surface and diecut text and a butterfly from the background. I trimmed the piece down to size and backed it with a bright yellow cardstock then traced around the butterfly cutout with black pen. I used two gold butterfly stickers to decorate the front and added three sizes of pearl to the bodies of the butterflies. The same sheet as the butterflies had some round flowers so I used three of those for continuity. 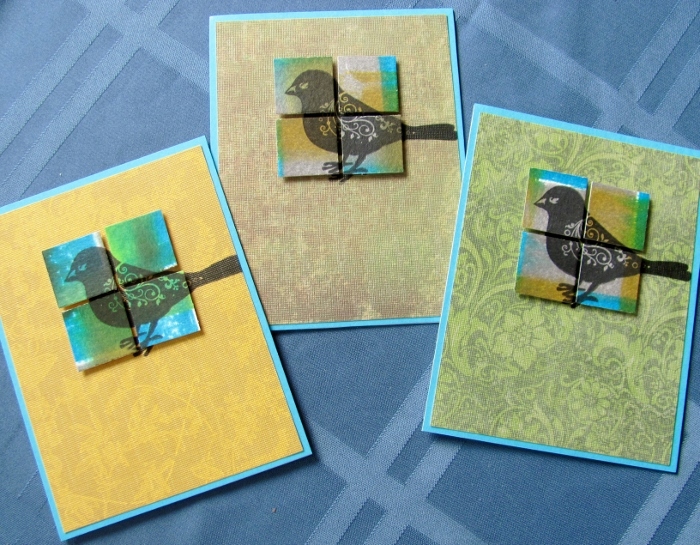 Not so long ago I shaared some cards I made with the experimentations using the mini-distress ink pads I had bought. The pads came in sets of four and I used four of them on those experiments without regard to which set the pads originated from. So I had four new pads left and wanted to do some different experiments. I had a brown, turquoise, purple and dark yellow. I pulled out a sheet of watercolor paper from a pad and took each of the colors in turn and made a direct-to-paper swipe top to bottom. Then I turned the paper and made stripes with each in turn until I ended up with a plaid. When the sheet was completely dry (I helped it along with the heat gun), I used a paper cutter to chop the whole page into one-inch squares. I sorted the squares by their dominant and accent colors as set up for the next steps. I chose four squares with similar coloring and arranged them on scrap paper in a grid with a small space separating them. Then I used black ink to stamp an image, letting the stamp hang off as needed. I selected a background (cut to 4 x 5.25) that went with the colors in the square. These papers were new to my stash as I just picked them up in a 12x12 pad at Tuesday Morning. I had cut each of the pages to 6x6 for ease in working with them. First, I stamped the image onto a stamp positioner. Then I laid the squares on the background where they would be mounted. I placed the stamp positioner with the image lined up on the squares, set the 'L' in place, removed the stamped plate, removed the squares and then stamped the image on the background. PERFECT! I used foam tape to mount the squares over the stamped background where their perfect alignment allows the image to show in the spaces between and aound the edges. Each card got a bordering piece to enhance the image and became the front on a white card base. I made 15 cards using 6 stamped images. I'm going to match these with envelopes and give them as a gift set of notecards. Throughout 2015 Ranger Industries released a new color of Distress ink every month. 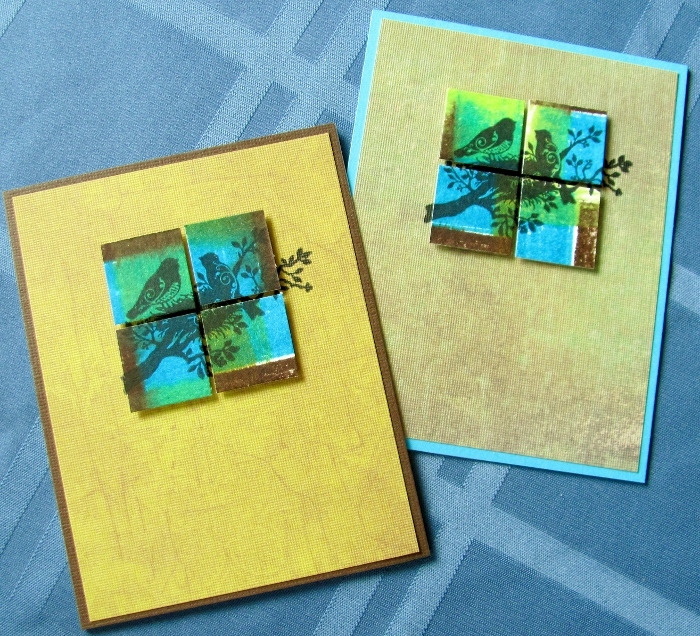 Tim Holtz introduced them and showed comparisons with similar color families alteady in the Distress line. I did not pick up any of these 12 new colors until this month, when I found 8 of them in the mini-sized ink pads (they come with 4 colors in a pack). I decided to do some playing with four of the pads and here is what I did. First, I chose Cracked Pistachio, Twisted Citron, Abandoned Coral and Fossilized Amber. I started with a coated paper and pressed the inkpads directly on it in a grid. These blocks of color stayed very wet so I decided to blot off some of the color using a piece of watercolor paper. I just pressed it straight down onto the color and held it there for a while so the color could soak into the watercolor paper. This picked up a lot of color and I wanted to blend it a bit so I misted it with water and let the colors bleed. To move the color even more, I pressed the piece onto a non-stick craft sheet. Then I dried it with a heat tool. There were a lot of colored droplets on the craft sheet so I pressed the dried sheet back into it several times and dried it again. The color on the original piece was still wet so I pressed a piece of regular white cardstock onto it, picking up more of the ink. I misted the new piece with water to activate the ink and dried it with a heat tool. The original piece was still a little damp so I just hit it with the heat tool. With all these pieces I used them as backgrounds for card fronts. This is the original piece - pressed direct-to-paper on coated paper. 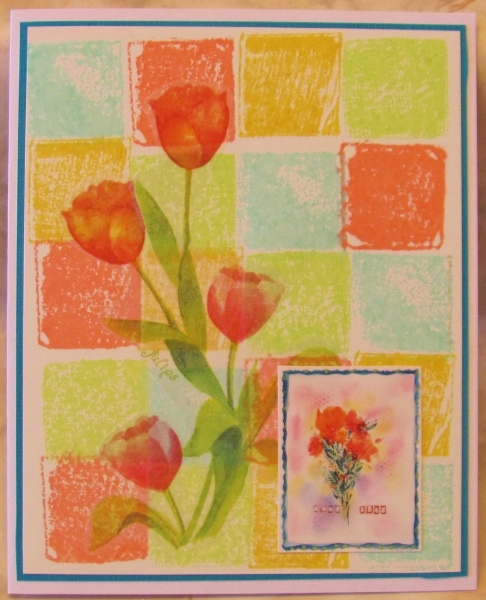 I added some vellum stickers of tulips and a cardstock sticker of another floral which had a teal border. 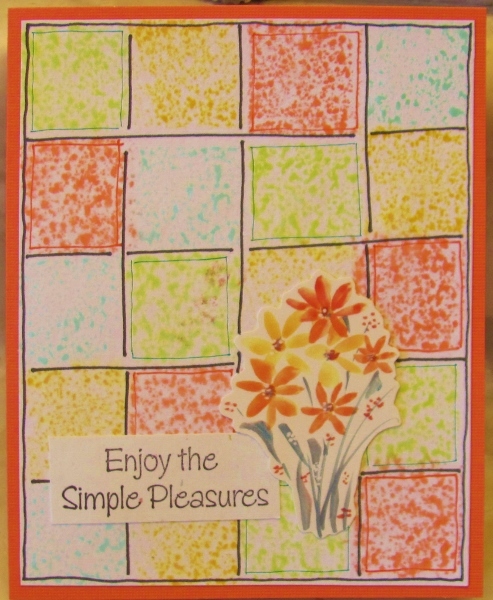 I copied that border as a layer under the block piece and mounted the whole thing on a white base card. I added a large vinyl sticker to the center and a second sticker off to the side. 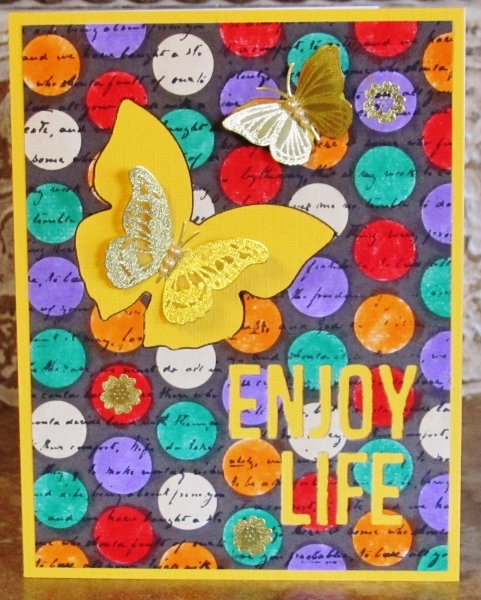 I used a bright yellow base card to go with the central flower. I reinforced the grid by using a heavy black marker. Then I chose a red and a green fine line marker to add inner borders to those colors. 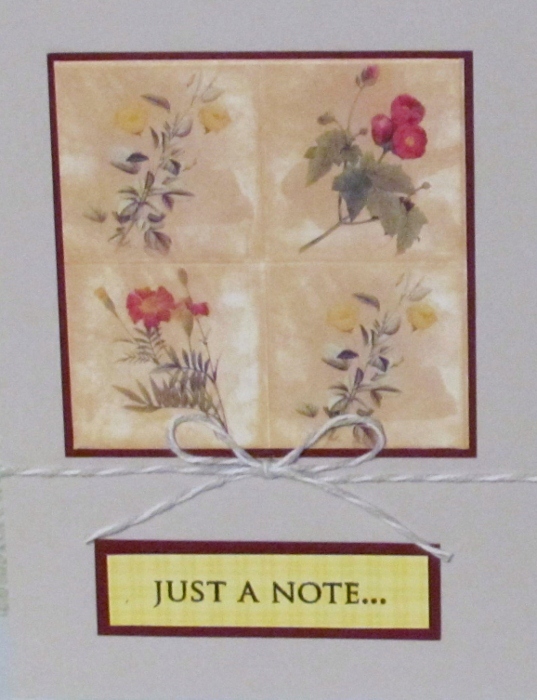 I added a cardstock floral sticker and a pre-stamped sentiment. 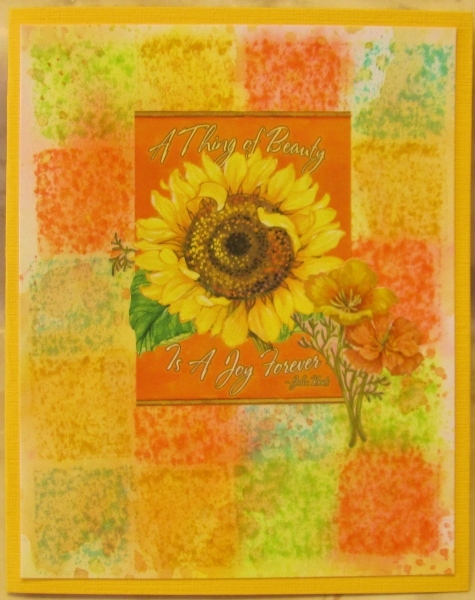 A coral base card picks up the color of the floral and one of the inks. I still have 4 new colors to play with but probably won't repeat this method of experiment with them. 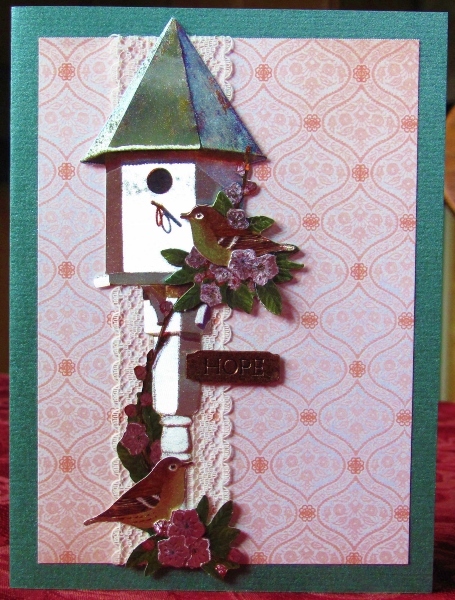 The final card for the recipe challenge - 3D, metal, lace - is here today. I chose a 3D with a bit of lace built in, with a doily in it. This first layer was applied to the card base with a background paper. Then I attached the strip of lace down through the 3D and constructed the rest of the image on top of the lace. I found a couple of gold corner elements in my 'metal embellishments' bin and tucked them into the 3D. The 3D sheet came with an extra butterfly (gotta love that) so I used it with the wings raised. I applied a gold peeloff sentiment with bits overlapping the lace and the background. 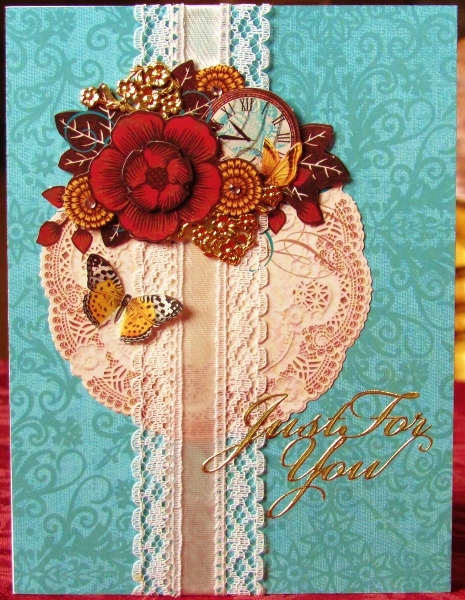 Back with another card from the supplies recipe challenge - 3D, metal and lace. I chose a foil 3D element for this one. Colors from the feature appear again in the background paper. I used a strip of flat lace and wrapped it over the background piece. A base card in shimmery green echoes the leaves on the foil. I used a coper metallic text piece. All the reflection in the foil piece make it difficult to get a good photo. 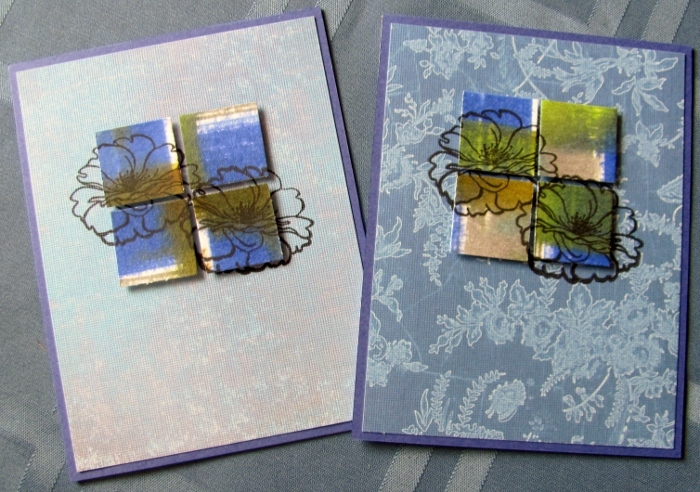 Challenge: Make a card using a 3D image, lace and a metal element. The card was supposed to be circular, too, but I totally missed that in the 'recipe'. I pulled out three 3D images that I thought would benefit from the addition of lace. First, I had a sheet with two clock elements - a border and a feature. I constructed both of them and substituted real gears for some of the smaller printed gears that were included. 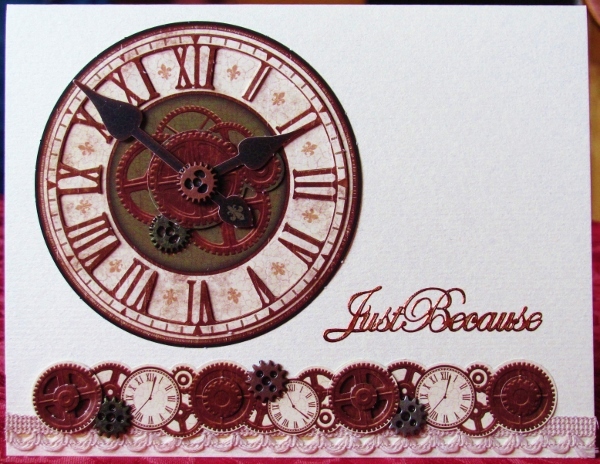 I placed a strip of lace at the lower border of the card and used the border 3D over top of it. Then I attached the main element to the left of the background area. I did not have any sentiments in the appropriate color so I used an alcohol marker on a silver peel-off sticker and placed that in the open area. How Do You Say 'Pfaff'? This was a hard entry to label with a 'topic'. Perhaps I should have created a new 'tools' category. Why? Because my dear hubby bought me a new sewing machine! Squeeeal!!! At that time I was midway through my second quilt and didn't expect that creative phase to last long. 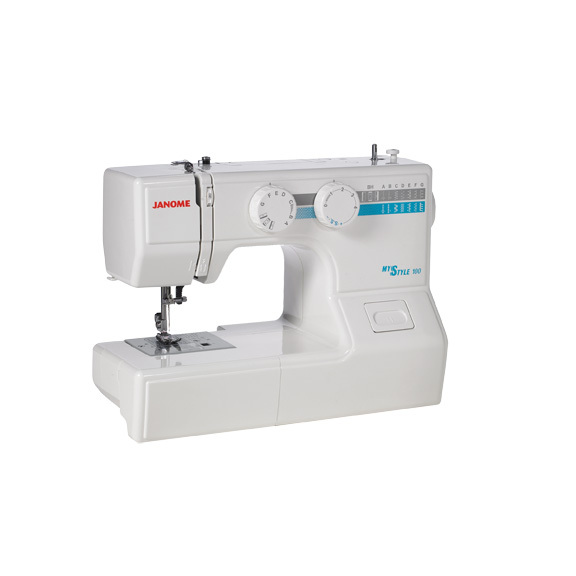 So I got a very inexpensive mechanical machine - the Janome MyStyle 100. I liked it because it was simple to operate but, in the long run, it had a lot of limitations. There are only 12 stitches and half of those are the 'stretch' versions of 6 basics. Other than the zigzag there is no control over the stitch width of any of the stitches. Needle positions are either straight down the middle or at the far left with nothing in between. Switching out presser feet is not easy. Poor speed control. And the most problematic thing is the very small throat that seriously limits the size of quilt you can work on. Yes, I know I have done a king size and several queen size but these were assembled and quilted in sections to accomodate the limitations of the machine. Well, I sat down with the salesman at Montavilla Sewing Center and told him what I wanted my machine to do. He answered every concern, one by one, with the Pfaff Quilt Expression 4.2 and even demonstrated other features that were a bonus. This is the machine - look at that awesome throat opening! Integrated Dual Feed only from PFAFF® for over 40 years!. Raises the presser foot with an easy movement, allowing you to kee your hands on your project. 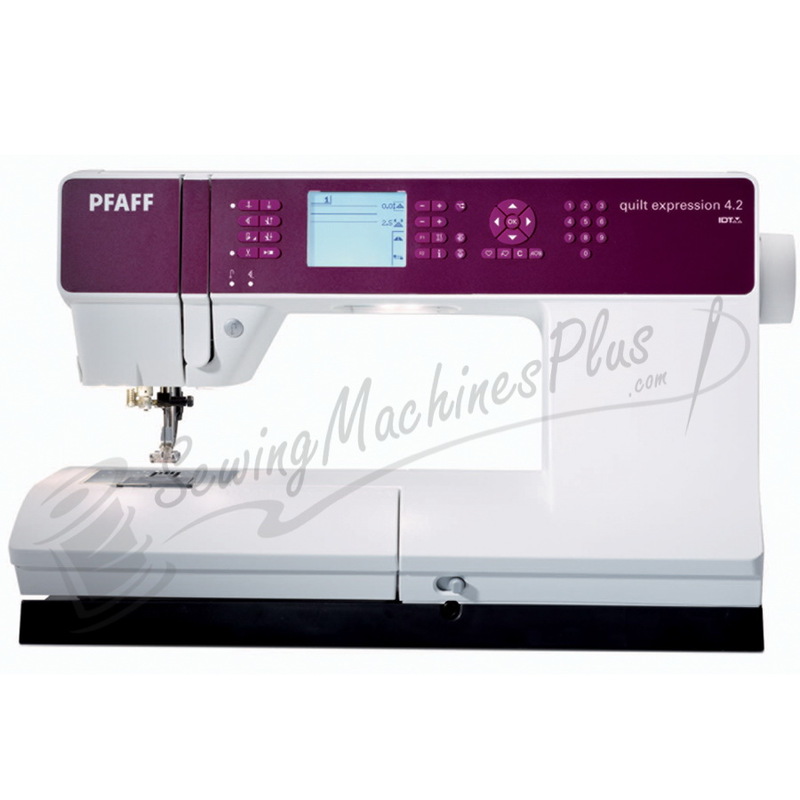 Sew without the foot control - Makes sewing long seams, free-motion and buttonholes easy. Select from over 250 stitches. Includes utility stitches, buttonholes, 9mm wide decorative stitches, quilt stitches, cross stitches and hemstitches. Choose from 2 fonts to personalize your project. 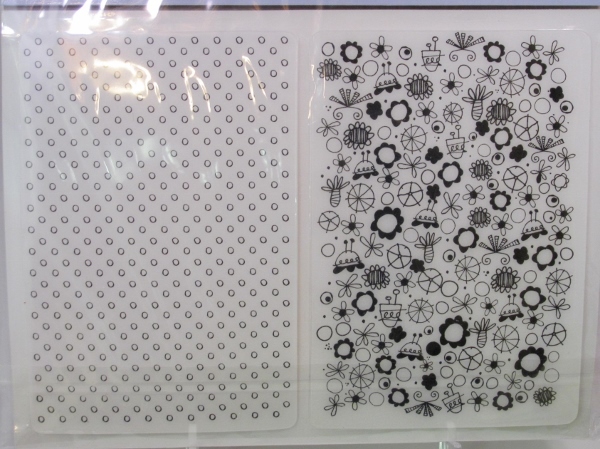 Different modes for free-motion quilting, thread painting or darning. Select the best mode for your specific technique. Limits stitch width to center needle straight stitch while using straight stitch foot to prevent needle breakage. 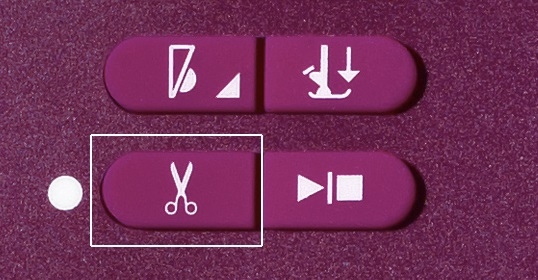 Quick and easy stitch selection by means of the Direct Selection Buttons. 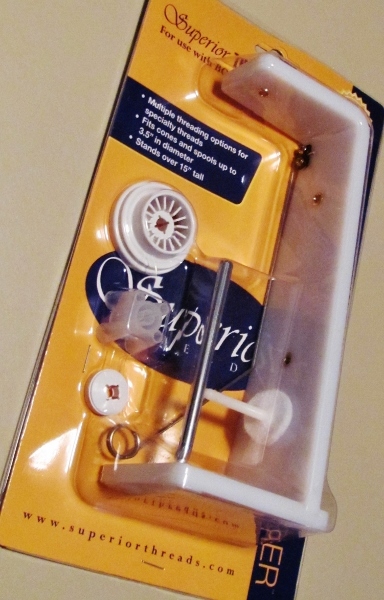 Needle thread tension is set electronically for every stitch – makes sewing simple. Features seam markings to the left and right of the needle to help you guide your fabric. The stitch density control adjusts the density, the distance between stitch points that make up the entire stitch. Density can be increased or decreased without affecting stitch length. Standard presser foot 0A, Fancy stitch foot 1A with IDT™, Fancy stitch foot 2A, Blindhem foot 3 with IDT™, Zipper foot 4 with IDT™, Sensormatic buttonhole foot 5A, Manual buttonhole foot 5M, Sensormatic free-motion/embroidery foot 6A, 1/4" Quilting Foot. Alerts you when your bobbin thread is running low. Choose from different languages in the Settings menu. 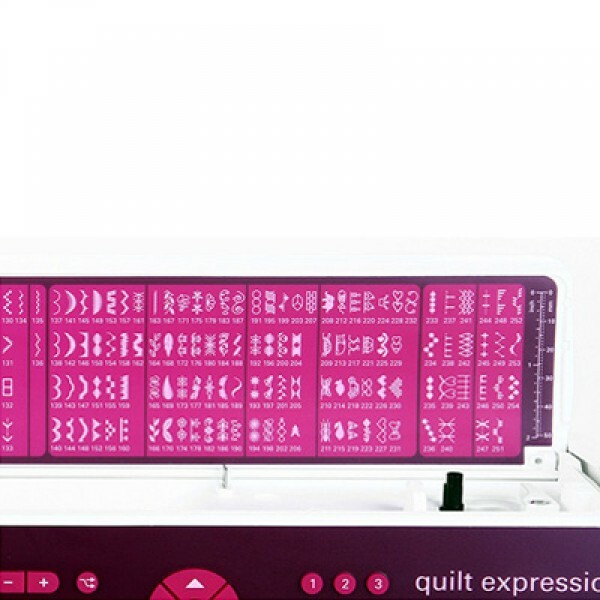 Make sure your PFAFF® quilt expression 4.2 speaks the same language you do. Simply touch to see important sewing recommendations on the illuminated graphic display. Adjust your sewing speed for specialty threads, techniques and personal taste. Combine and save up to 40 stitches and/or letters in one of 20 sequence memories - sew in one step repeatedly. Change the settings on built-in stitches to your personal liking. Save in one of the 20 personal stitch memories. 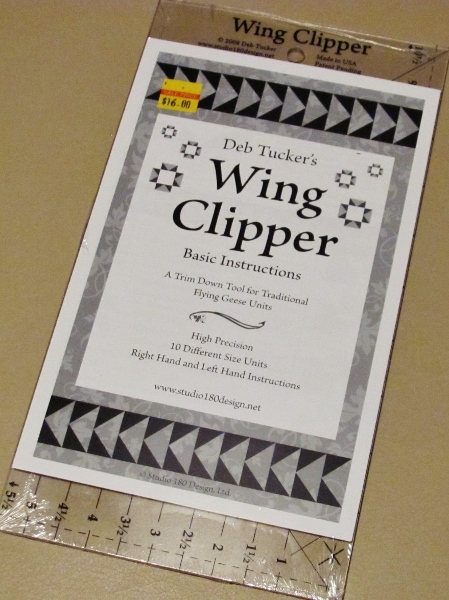 Program a stop, thread snips or tie-off into a stitch sequence. Your sequence does exactly what you want every time. 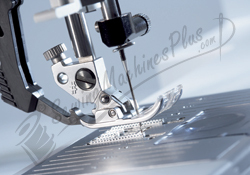 Enhanced to provide more control when sewing through thick layers or seaming small pieces. Now if I can do this ^ on my computer keyboard, imagine how impressive it will be when I learn how to do all that (and more) on my new sewing machine! Who doesn't love a bargain? And if it is on something cute, so much the better. I often make a quick swing by the clearance bin at the local craft store to see if there are any great deals to be had. 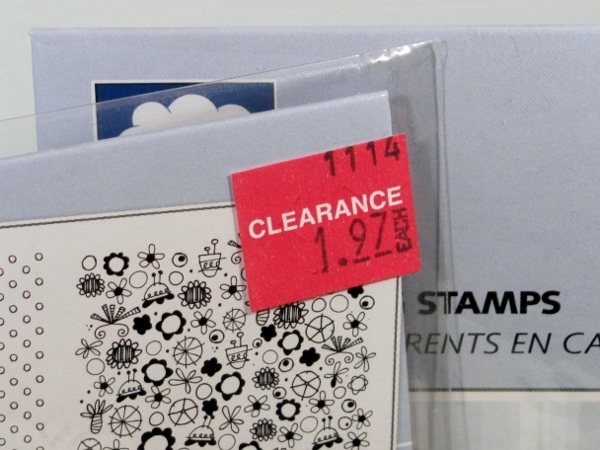 Oh the joy the other day when I found two different pairs of background stamps on deep discount. Each package has two cute background stamps. They are rubber mounted on cling foam to use with an acrylic block. After pre-washing quilting fabrics they are limp and easily skewed out of square. 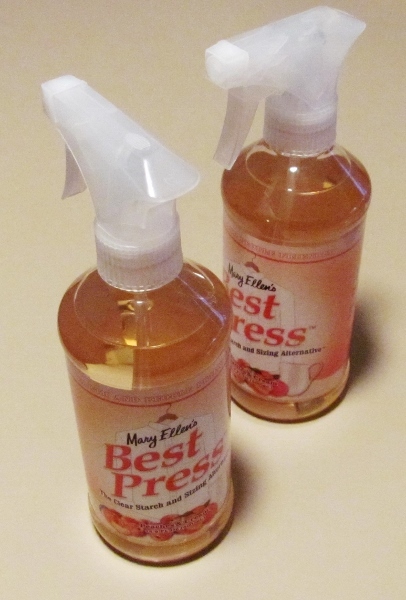 Starching is one option but I fell in love with Mary Ellen's Best Press. The scent I was introduces to it with was lavender. But at the Sewing Expo I found the booth selling it and fell in love with the peaches and cream scented one. This is so yummy I may be spraying even when I don't need to! I have wanted to buy thread on large cones as a time and money saver but my machine is not set up to accomodate them. I looked at several cone holders at the Sewing Expo and decided on this one. It also has a side-facing holder so a standard spool winds off the side rather than spinning off the end like the sewing machine holder requires. 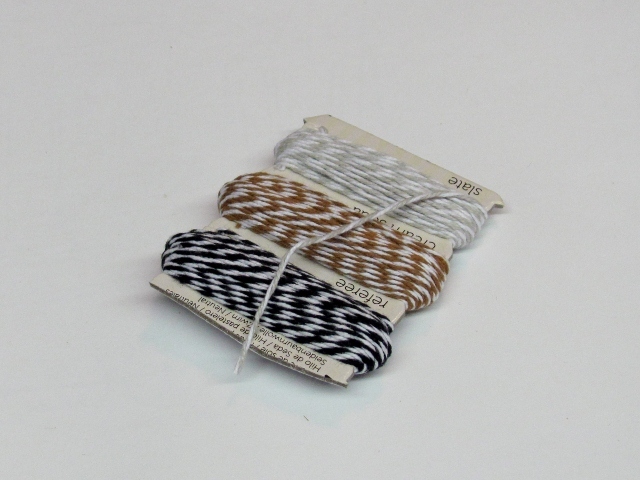 This is especially good for metallic or other wrapped threads to keep them from tangling. 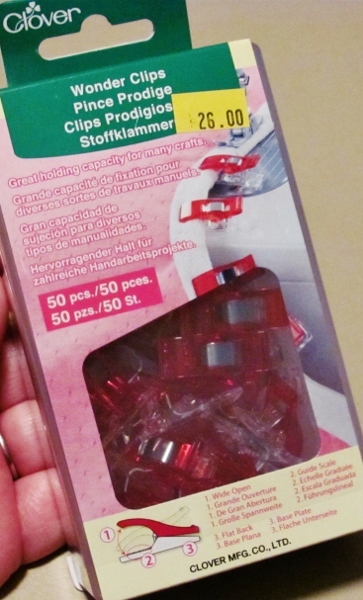 When I am at the point of quilt binding next I will gladly be reaching for these little clips I picked up. Clover makes them in two sizes and these tiny ones are perfect for clipping binding in place in replacement of using pins that poke you. They can be used for either hand or machine stitching a binding, just taking them out as you come to them. As you can see, I bought the box of 50 so I could do the whole binding at once instead of only clipping a bit at a time. 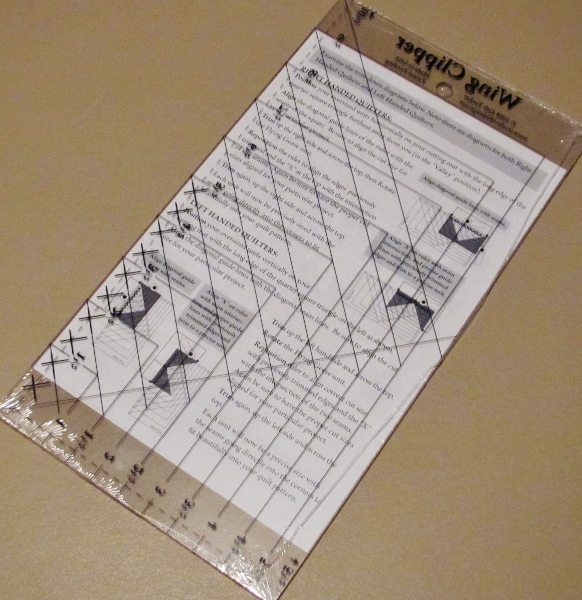 At the Sewing Expo I saw demonstrators using GlowLine tape to mark their rulers. Makes it a snap to line up the right rule line over and over without error - and you can see right through it. As you can see the package comes with pink, orange and yellow tapes so you can easily find one to use against any fabric. Most of the quilting I have done is A) stitch in the ditch B) totally random like stippling or C) outlining a motif on the fabric. I have done a couple where I needed to mark the fabric to free-motion stitch and have had varied success with different methods of marking with disappearing pens, erasable pencils and stitching through printed papers. I decided to pick up these marking sticks. They are very waxy feeling and supposedly disappear completely when passed over with a steam iron. A standard pencil sharpener can be used on them to maintain a point. 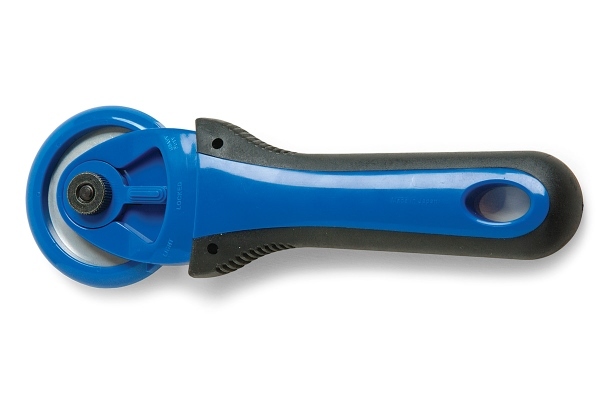 Like many of the other rotary cutters cuts are made by pressing down on the blade which pushes the safety rim (the blue circle portion) out of the way. I have found though that when cutting through stacks of fabric (say 6 layers and up) the blue safety rim rides along the fabric causing it to bubble along the edge you are cutting and can mis-align it. If you are cutting with the created strips off the ruler this can be not so much of a problem. But if the measured parts are under the ruler then the layers becoming mis-aligned are those you need to cut next. Well I decided to look for another type of rotary cutter and found two options. Option one was to go with one where the blade locks exposed. then you have to continually close it when you lay it down or risk cutting yourself if it is left locked open. 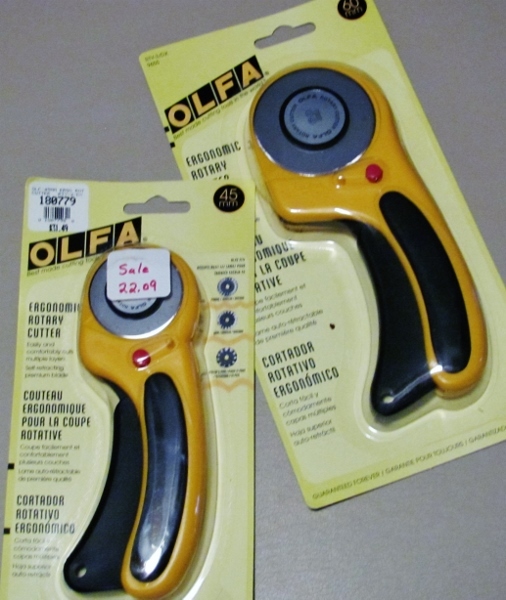 Option two was to go with the OLFA cutters that have a grip handle that exposed the blade and when you let off grip the blade retracts. This is what I chose to get. In fact I decided to get it in two sizes. 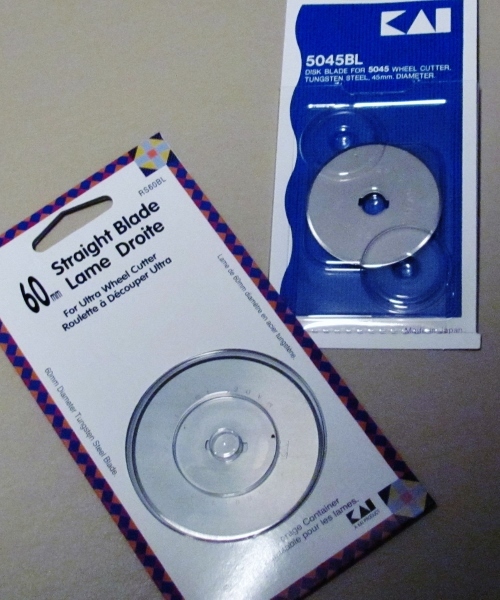 The 45mm fits the blades I already had and the 60mm will allow me to cut faster on big units. While I was at it I bought extra blades for each from KAI in tungstun steel. These are supposed to hold an edge longer. While at the Sewing Expo I picked up a ruler for accurately trimming Flying Geese blocks. This ruler lets you trim out multiple sizes, which is just awesome. I am actually in the middle of a quilt project that the next step is trimming up flying geese blocks! Talk about timing! At the Sewing Expo I won a door prize at one of the sessions. 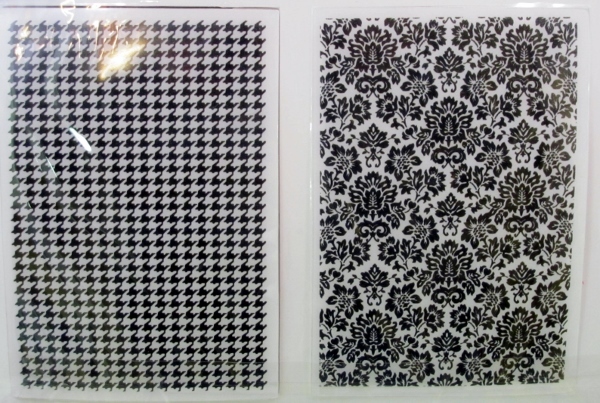 I got to choose two patterns for paper pieced wall hangings at one of the vendors. YAY! 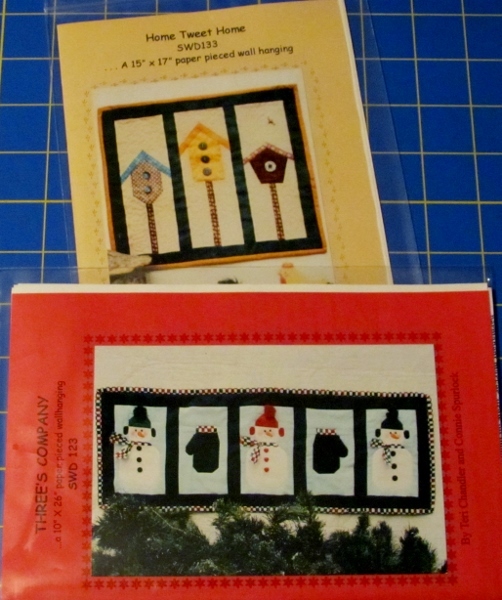 I chose a Christmas banner with mittens and snowmen and a spring pattern with three birdhouses. I already have ideas for both of these. For the next few days I will be sharing the goodies I picked up on my recent field trip. 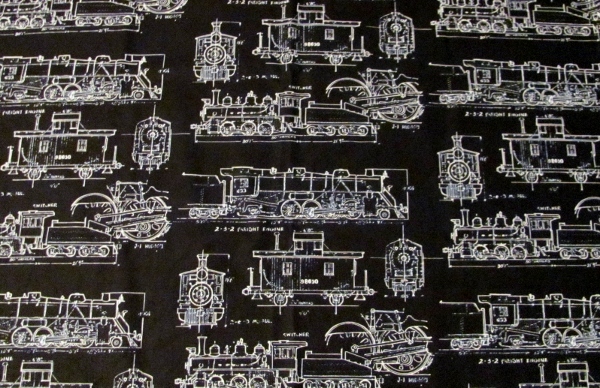 Today it is this totally cool piece of yardage. On several cards over the last year I've used 'scrapper's floss'. It has the look of twine but is really tightly twisted paper! 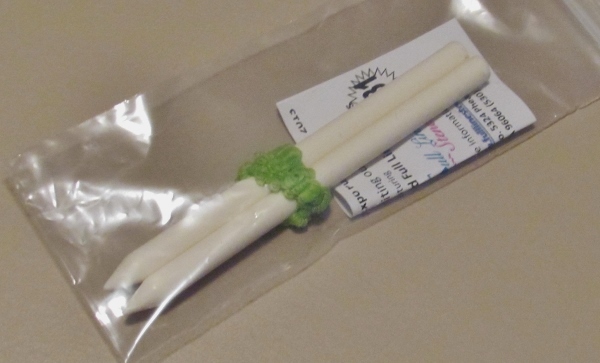 It comes in a package that looks like dental floss. Then,as a gift, I received a card with three colors of 'baker's twine'. 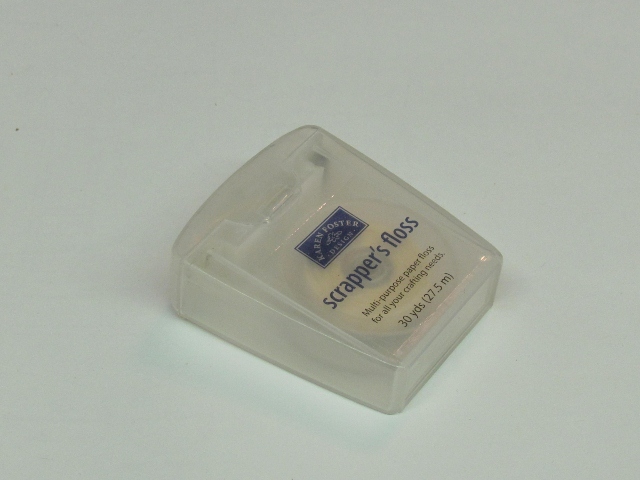 I like this as much as the scrapper's floss and it is softer to work with. Well, delighted I was to find at the craft store packages of colored twine (15 yards each). There were 12 colors with two rolls of each colors. Yay! One set for me and one set to give as gifts. 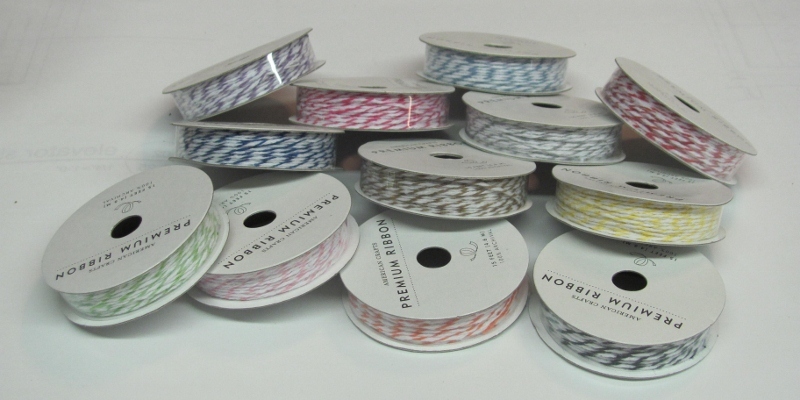 And then I found, at the same store, a similar set of baker's twine - 12 colors with 2 rools of each color. Again, I will keep a set and gift a set. I wanted to be able to see these so I would be reminded to use them and because they are so cute! 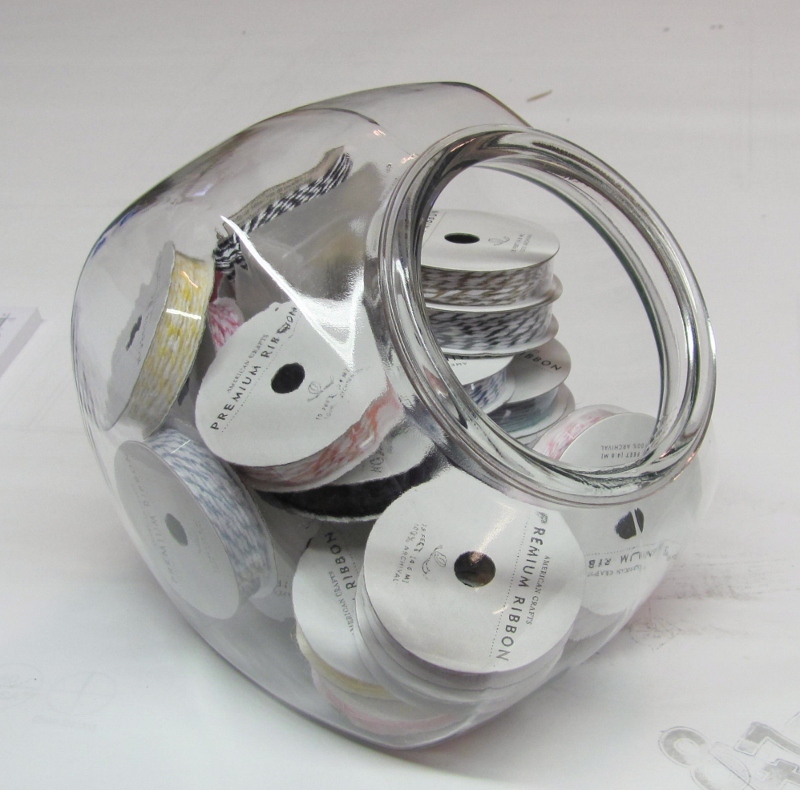 So I moved some ribbon scraps from a 'candy jar' and loaded it up with my new (and old) twines. If you start with two 12 x 12 pages that are covered with botanical tiles and do some creative cutting you can come up with LOTS of cards. Some of the tiles are small and some are medium - the size of 4 small tiles. 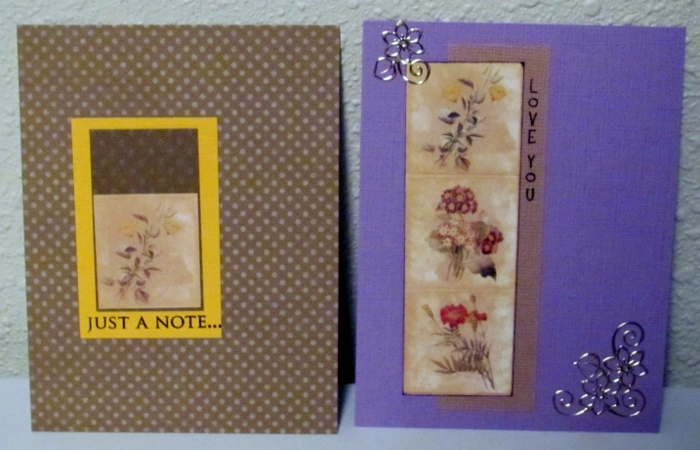 On the left I used a single small tile popped up on foam over a dusty purple panel stamped with a sentiment. I rounded the corners and placed on a tone-on-tone dotted cardstock. On the right I used a strip of three tiles and scored between them. A sentiment strip peeks out from the top and I've mounted on a 1/2 and 1/2 printed background. This next one ses a grid of 4 small images, scored and banded n burgundy. I used the same color to mount the stamped sentiment. Both are adhered to dove gray cardstock and tied with a gray and white bakers twine. 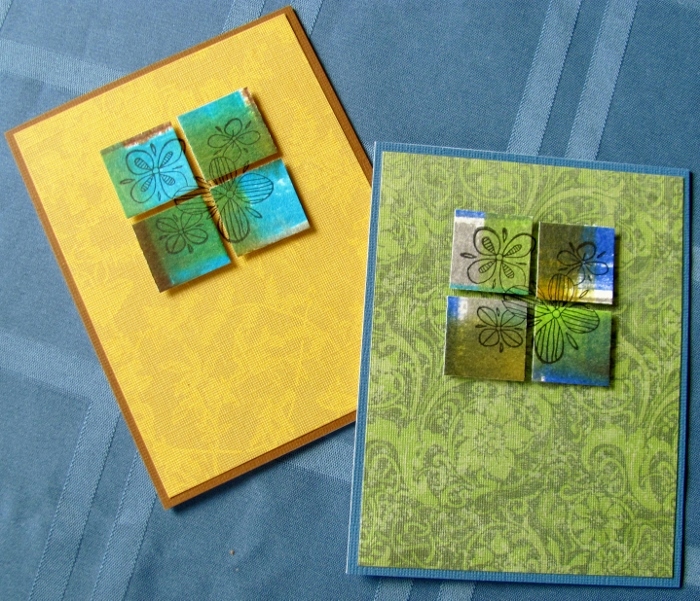 A grouping of 6 tiles, scored, are mounted on a dark dotted cardstock using foam tape. a small sentiment is raised on foam tape in the center, as well. Both of these next ones use one of the medium images. On the left I used a combination of red and white chevron and a tone-on-tone dot. A small red sentiment peeks out from under the image. On the right I used a full background of the chevron and rounded the corners of the sentiment and image. Both are popped up on foam tape. On the left, I used a vertical strip of three small images. 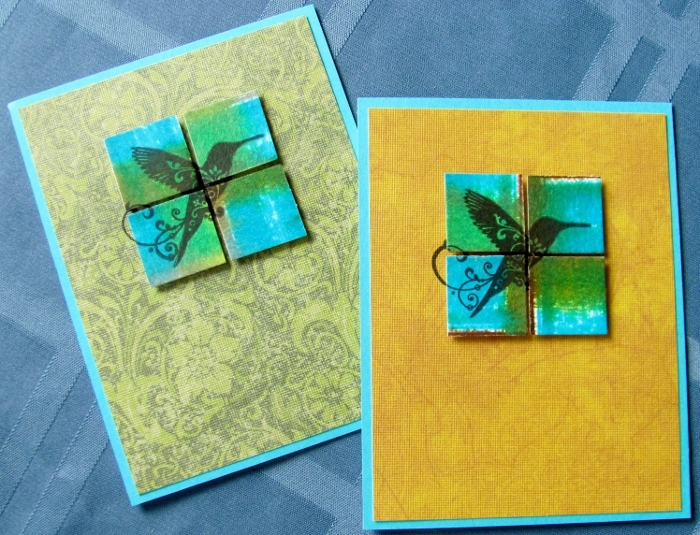 A vertical stamp was used on the right on sage cardstock. I backed the image with a striped paper over a patterned rust cardstock. On the right is a grid of four small images where I used a white gel pen to reinforce the creases in a sketchy line. The sentiment block is dropped to the left over purple cardstock. A wrap of scrappers floss is knotted at the top. 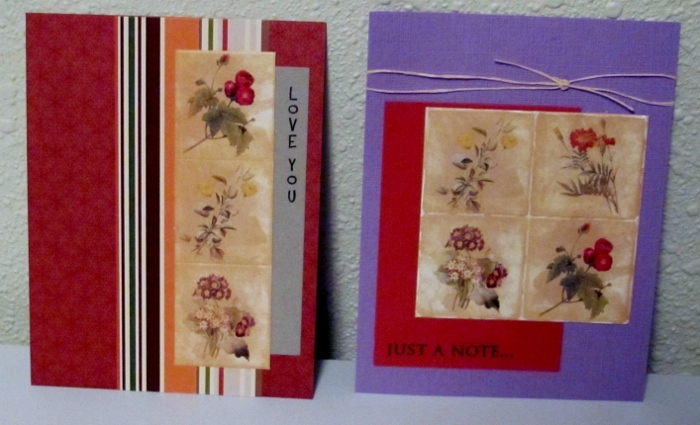 Here on the left I used a single small image, backed it with a dark dotted card over a golden sentiment block. A simple dotted background finishes it. The card on the right uses a strip of three small images and features a vertical sentiment on the right. 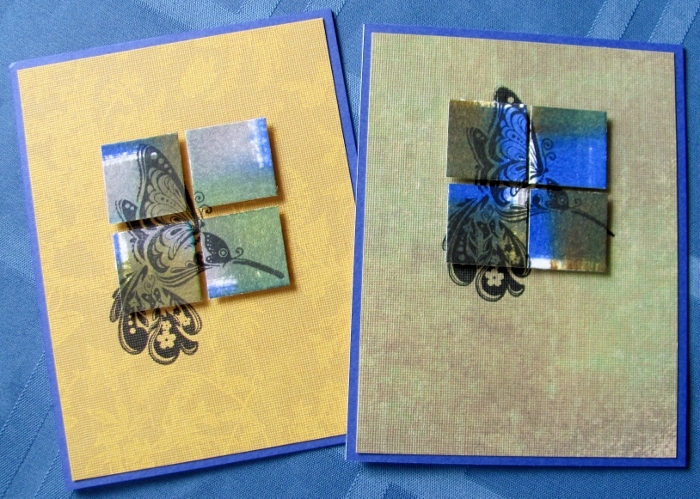 The purple cardstock base is enhanced with gold peel-off stickers in the corners. 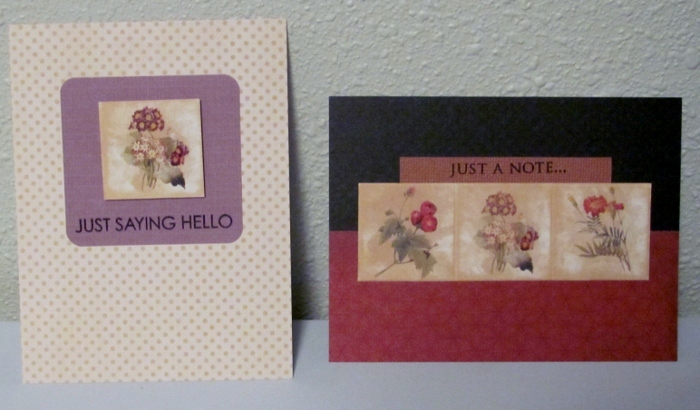 The card on the left features two small tiles with rounded corners as well as a small stamped sentiment with rounded corners. Both are popped up on foam over a die-cut oval tinted with distress ink. The dark green card base has deep rounded corners. 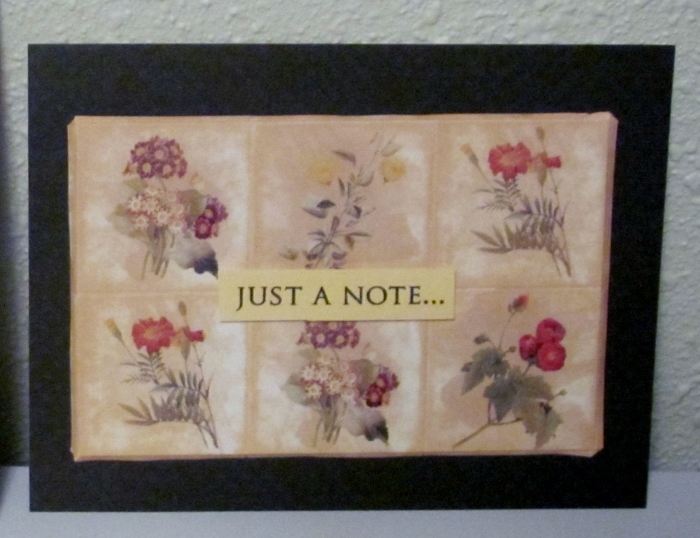 Last, but not least, the card on the right uses two small images linked with a sage sentiment strip. 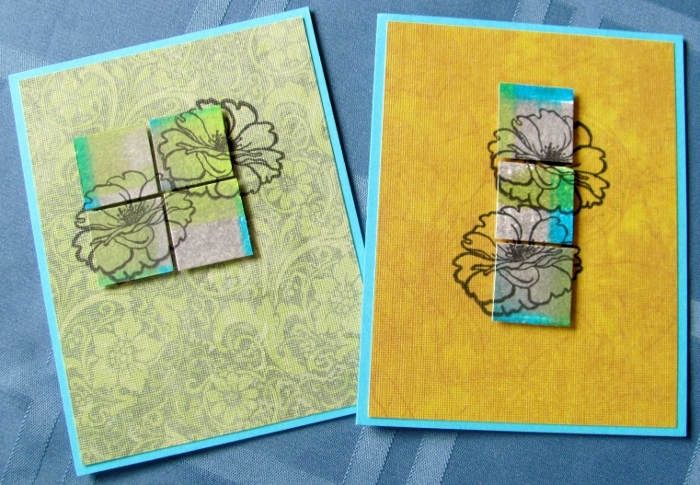 Two die-cut scrolls in golden cardstock are used to enhance the raspberry background. 12 cards from 2 12 x 12 sheets!